Meiwa kumquats are round in shape, with an average size of 3 centimeters in diameter. They have a thick, aromatic peel high in volatile oils, that offer a sweet flavor. Meiwa kumquats are entirely edible, including occasional soft seeds. The flesh is tart, and consuming or using both the skin and flesh together will create a sweet-tart flavor balance. Meiwa kumquats are available in the winter through spring. Meiwa kumquats are botanically classified as Fortunella crassifolia. Round kumquats are generally considered to be sweeter than the oval varieties, and the Meiwa is sometimes referred to as Sweet kumquat. Kumquats were originally classified as Citrus japonica, citrus of Japan, until receiving their own unique genus distinction in 1915. The new genus was named for horticulturist Robert Fortune, who introduced the kumquat to Europe in 1846. Meiwa kumquats are high in vitamin C, and contain good amounts of vitamins A, E and B-complex. They also contain antioxidant-rich flavonoids, which are more concentrated in the skin. The skin also contains high amounts of fiber and pectin, as well as volatile oils that offer both health benefits and essential oils. Meiwa kumquats are entirely edible, making them versatile in both sweet and savory applications. They can be eaten fresh, cooked, or preserved. They can also be used as an ingredient in desserts, beverages, and salsas. They pair well with white meats, seafood, red meats, chiles, herbs and creamy cheeses. Store Meiwa kumquats at room temperature for up to a week, refrigerate for up to three additional weeks. According to Japanese botanist Chozaburo Tanaka, Meiwa kumquats were accidentally introduced to Japan by a shipwrecked Chinese sailor. The sailor carried preserved kumquats in his pocket when he washed ashore in Suruga Bay on the east coast of Japan's main island. Seeds from the preserved kumquat were planted and grown in Shizuoka Prefecture, and according to Tanaka, the tree was still standing early in the 20th century. Meiwa kumquats are native to China. They are a natural hybrid of Nagami and Marumi kumquats. They were brought to Japan from China during the Meiwa period between 1764 and 1771, hence their given name and their previous classification as Citrus japonica. Meiwa kumquats were introduced to the United States in 1910. Commercial cultivation is modest for Meiwa kumquats compared to the more well-known oval varieties. They are grown in Chekiang Province of China and to some extent in Fukuoka Prefecture of Japan. The trees are also grown as ornamentals in the United States. They can be spotted at farmer's markets and specialty stores. 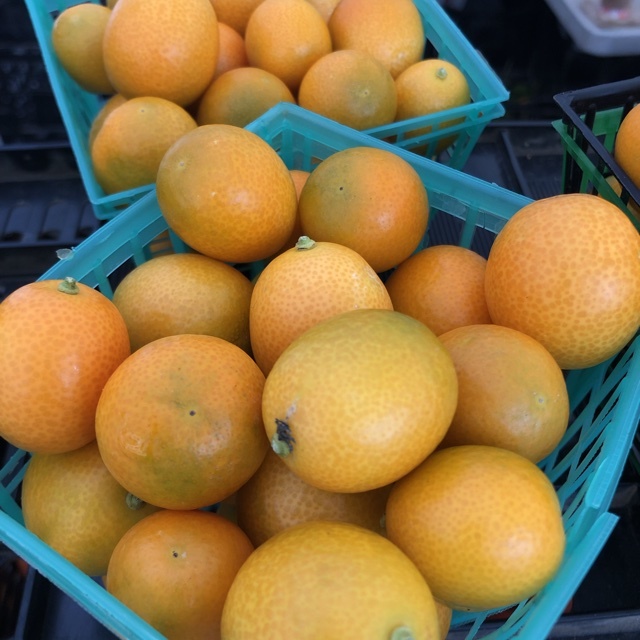 People have shared Meiwa Kumquats using the Specialty Produce app for iPhone and Android. Sharer's comments : Meiwa Kumquats spotted at First Alternative Natural Foods Co-Op.